The idea that adolescence was a separate and vital stage of human development only emerged at the turn of the 20th century. By the end of the 1950s, when the largest cohort of children ever born in Canada reached adolescence, the depiction of teenaged children as moody and rebellious was widespread, and psychologists and educators were publishing books to help parents understand, guide, and discipline their teenagers. It’s likely that many adolescents caused their parents no less and no more grief than they do today. While “kids these days…” may seem a timeless adult complaint, several aspects of adolescent experience changed in mid-century Canada. One important change was the frequency of secondary school attendance and graduation. In 1939 in Ontario, studies showed that for every 100 pupils that started school at age five, less than half reached Grade 11 and only 12 finished high school. The secondary school curriculum was focused on academics and university preparation, and at least half of teenagers left school as soon as they could, at age 16. In farming communities, boys’ education was often shortened or interrupted because their labour was needed on the farm; in urban centres, working-class boys and girls continued to contribute to the family income, either through part-time or full-time jobs. By 1951, the census recorded that 40% of young people aged 15 to 19 years were attending school. More were obtaining high school diplomas than ever before. 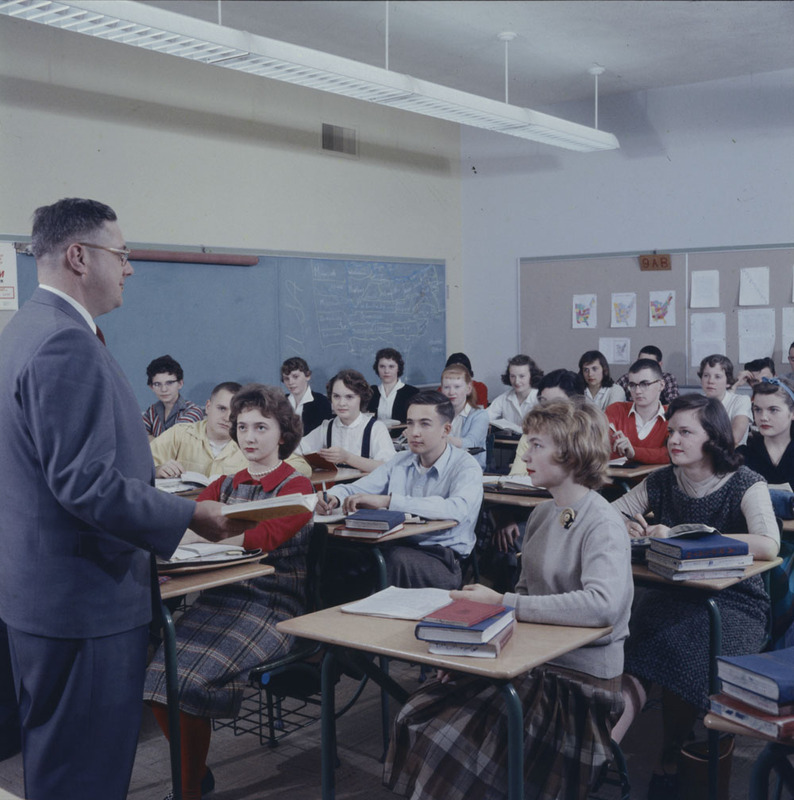 Figure 10.20 The baby boom generation stayed in school longer, causing demand for new facilities and more teachers. Laurentian High School, Ottawa, 1959. As more young people remained in school, the high school became the institution most associated with teenagers and with youth culture. The growing influence of youth culture was another important change in adolescent experience in mid-century Canada. High schools gathered more adolescents together, more often, and for longer periods than any other institution. In the postwar years, more Canadian high schools had sports teams, music bands, and other extra-curricular activities to bring young people together. Since the 19th century, secondary school students had fostered their own, age-based and class-based cultures; however, when fewer teenagers attended school, the impact of that culture was not noticed beyond the schoolyard. 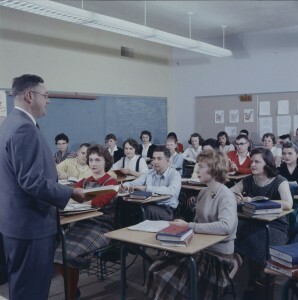 By mid-century, adolescent trends, athletics, and activities were widely reported in newspapers and magazines, and many adults — from psychologists to journalists and medical doctors to advertising agencies — saw the high school as the best laboratory in which to study the habits, values, and desires of Canadian boys and girls. Teenaged behaviours were closely scrutinized and often criticized as deviant and — in the context of the Cold War —potentially dangerous. For example, the media, psychologists, and parents all questioned the teenaged trend towards going steady (developing longer and more serious heterosexual relationships rather than dating a greater number of people). Teenagers claimed going steady gave them the social advantage of always having a date, and that it relieved the economic pressure of spending too much on social outings. Adults, on the other hand, worried that teenagers’ need to fit in reflected a tendency towards social conformity that could undermine democracy. Finally, if adolescence was prolonged, it ended more abruptly than it had for teenagers in previous generations. School attendance, youth culture, and popular psychology encouraged the idea that the teenaged years were a distinct and crucial stage of personal development, but at the same time the generation that came of age in the 1950s and 1960s reached conventional markers of maturity — economic independence, marriage, employment — much sooner than their parents or grandparents. During the 1930s, unemployed young men riding the rails or populating the government’s relief camps were unable to start their adult lives. Marriage and birth rates fell as couples delayed starting families. In contrast, during and after World War II, the growing economy meant that high school graduates — and even drop-outs — found jobs more quickly. A greater measure of economic security meant more young people could marry at younger ages. In 1950, more than a third of all Canadian women were married by the time they were 22 years old. Compare this to the first decade of the 21st century, in which only 10% of women married before they were 25 years old. Many adolescents at mid-century could look forward to greater access to education, more recreational opportunities, and a society that expected them to spend time with their peers, explore their own personalities, and delay adult responsibilities. However, it’s worth remembering that many adolescents did not have these experiences. Young First Nations boys and girls continued to have limited employment opportunities and were forced to attend Residential schools, where many suffered physical, emotional, and sexual abuse. In Alberta and British Columbia, several thousand adolescents defined as having developmental and physical disabilities were sexually sterilized, sometimes without their knowledge or permission. Many more lived in institutions. Racial discrimination meant that Chinese-Canadian, Japanese-Canadian and African-Canadian youth were rarely represented in the media, nor targeted by retailers seeking teenaged customers. Historians strain to hear the voices of these adolescents in the historical record, and little is yet known of their experiences of growing up. Figure 10.21 The emergent norms of teenagehood did not extend to everyone. Angakkaq was born and raised at Arviat on the west coast of Hudson’s Bay. She was in her teens when she died of influenza in the 1940s. Adolescence, as a stage of human development, was only widely recognized in the 20th century. It was studied and increasingly treated as a problem for adults to solve. Increased and prolonged enrollment in schools led to the creation of teenage culture and high schools was the crucible in which that occurred. Staying in school longer was enabled by an economy that could readily absorb young workers and which thereby contributed to earlier and more widespread marriages. Racialization of communities impacted the ability of many young Canadians to enjoy the opportunities made available to southern, urban, and European-Canadian teens. Comacchio, Cynthia. The Dominion of Youth: Adolescence and the Making of Modern Canada, 1920-1950. Waterloo: Wilfrid Laurier University Press, 2006. “Young in a Small Town” (1967), produced for Camera West, a CBC television program. A geography class, Laurentian High School. Ottawa, Ont. (Online MIKAN no.4301846) by Library and Archives Canada is in the public domain. 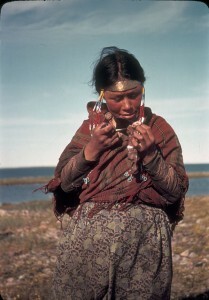 Young Inuit Woman [Angakkaq, born ca. 1928, daughter of Aliqqut, died as a teenager of influenza in the 1940s. Her brother Louis Angalik, born in 1938, still lives in Arviat.] (Online MIKAN no. 3576505) by D.B. Marsh / Library and Archives Canada / e004665469 is in the public domain. 10.11 Historical Experiences of Adolescence at Mid-century by Katharine Rollwagen, Department of History, Vancouver Island University is licensed under a Creative Commons Attribution 4.0 International License, except where otherwise noted.